Located in the eastern part of France, Alsace borders Germany to the east and Switzerland to the south and has a very rich history of its own. You will find medieval castles atop most hills, World War I and II battles sites and medieval walled villages tucked in the valleys along the foothills surrounded by vineyards. 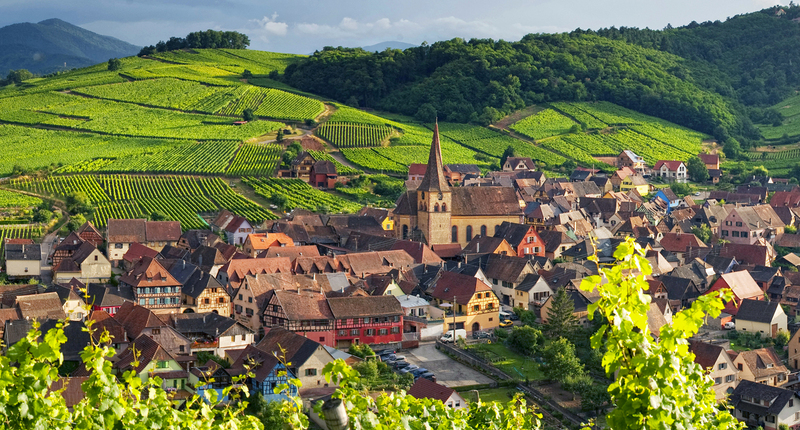 Alsace is one of the top wine producing regions of France: rieslings, gewürztraminesr, muscats, pinot gris are just a few of the better known wines you will find in the area when you visit the local winemakers. And the food! From local winstubs (small bistrots serving local food and wines) to some of France’s finest restaurants, unforgettable dining experiences are to be found around every corner in Alsace. And then there is the cycling. You cannot find a region of France offering more opportunities for every cycling level. The plaine d’Alsace is mostly flat with bike paths abounding along canals, farms, fields and villages and is perfectly suited for the casual rider. The foot hills of the Vosges are the wine regions and offer more rolling terrain through medieval villages and the "route du vin" and is appealing to almost any rider. To the west you find the Vosges Mountains. Although they are certainly not as high as the Alps, they still offer some very challenging climbs, breathtaking views and great down-hills. In fact, the very first mountain stage the Tour de France ever rode was up the Ballon d’Alsace ! And most of the roads we will ride enjoy very little car traffic.